I have a friend who meets all of these requirements and who would be willing to take Milo and then send him to us. But Boxer Rescue will not be a part of this as they insist on the Boxer being neutered before he is rehomed. All we want to do is offer a loving home to a dog, and the owners’ conditions are totally unrealistic and represent cruelty to me in the softest degree. Not wanting to dwell too much on this I turned to my kitchen for solace. And carrot soup offered just that. I julienned the carrots using the new drums for my Kitchen Aid and added drops of tarragon oil to the soup before ‘drowning’ myself in a bowl. When I lived back in the UK I thought some of the condition imposed where, at times, quite strict. But these are beyond, make no sense at all. Really silly of them. I can so relate to your dog story, Tandy: the previous owners of my boxer-frenchie mix made the same request of not having him neutered. You cannot imagine the turmoil I was in when he got in trouble with other “whole” male dogs and they behaved aggressively towards him. When I finally contacted them to let them know it was imperative to have him neutered, they thanked me for informing them. A good ending to a lousy deal. He is fine now with other male dogs, his behaviour has not changed (still has his high energy level) and he has not gained an ounce of weight since. Lovely soup recipe, comfort food for foul days! Hi Tandy, so sorry about all the conditioned rules, seems like they were making unreasonable conditions much harder. Love this soup, perfect for heartier times. Tandy, I so agree – that owners conditions are unrealistic and not very nice! To insist the dog be bred is hard to fathom for me! UGH – so sorry about this – would you not be interested in going to a rescue to get another boxer? 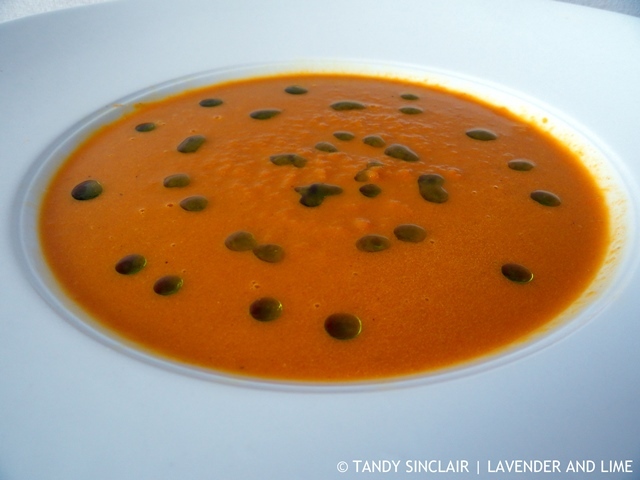 BTW – LOVE the cumin and ginger in this carrot soup – definitely heart warming! Perfect for these cold days and so much more interesting than pumpkin soup! Those are severe and lengthy conditions! Sorry it did not work out with this one. But another Boxer will be perfect soon! Great soup in the mean time, simple but perfect. Your carrot soup sounds delicious. What a dog story! I can see how this carrot soup would bring you great comfort. Soup is a favorite at our dinner table. Love your use of cumin and ginger to give this the perfect amount of zip. Yum! That is crazy!! I feel like as long as the dog is going to a good, loving home, they should be happy! I love how simple this recipe is but yet it looks so delicious! Unusual criteria – usually rescue dogs are neutered or they insist that you neuter them at a later stage as they discourage breeding for the dog’s sake and to enure that people don’t take dogs on to just make money out of them. When the right pup is there for you, you’ll know. Love carrot soup by the way, a lovely recipe! I am sure the right pup will come along soon! The saga ended there sadly! Amazing you don’t like carrots, why not? Really? That seems a bit odd having such strict requirements. What happens if noone can meet all those points? Do they put the animal down. Far out! I seriously hope they did not put him down! There are SO many animals in need of loving forever homes and for someone to have so many ridiculous conditions is beyond me. I could never re-home any of our animals – it the same has having a child and then a few years later re-homing them! I know everyone has different lives but I don’t feel people should get animals if they can’t look after them for their full lifespan. I love carrot soup and can’t believe I have never thought to add ginger to my Nana’s wonderful recipe.